A bottle of Italian Moscato d'Asti, perfectly effervescent with a bouquet of white peaches and orange blossoms, is paired with traditional Turkish Delights, one of the most popular and well-loved treats, representing Turkish hospitality. Not overly sweet with just the right consistency, these Turkish Delights are made with double roasted pistachios for that unique blend of sweet and salt. One bottle of Ruffino Moscato d'Asti. For more information on this wine, please see the Tasting Notes. One Tin of Traditional Imported Turkish Delights. Each gourmet item is carefully assembled, and the gift is accentuated with a hand-tied satin ribbon. A free card is included with your personal message or greeting is included with your gift. Measures 14" x 7" x 7". 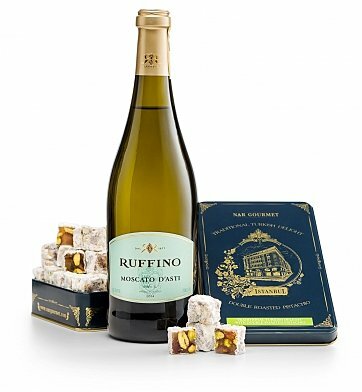 Moscato and Turkish Delight Pairing Gift is a hand delivered gift. These gifts are delivered by one of our local design centers located throughout the United States and Canada. Same day delivery is available for most gifts when ordered before the cutoff time. The cutoff time for Moscato and Turkish Delight Pairing Gift is in the recipient's time zone. Ruffino Moscato d'Asti, a semi-sparkling sweet Italian wine. Gift tin of traditional Turkish Delights, made with double roasted pistachios.